I think it could be quite possible. Although I dont know much about your motor nor do I know much about the larger 3 phase brushless systems BUT Its been my experience that a 3 phase brushless has a very hard time generating any torque when power is applied at at 0 rpm under static load. Have someone push the car in gear so the motor has some initial rotation even if its only 60 or 80 rpm then apply power OR let it coast down and see how low the speed has to get before it starts to buck when applying power. Well, I wasn't able to figure out the jerkiness on my own (thanks for the suggestions Gun) so I'm taking it down to Electric Cars of NY this weekend to let them have a look. I have my two-week Army Reserves training at Ft. Dix, NJ starting next week and their shop is on the way. So I'll let them look at it and hopefully they'll be able to straighten things out in time from me to tow the car back at the end of my two weeks. Well, I got the car down to the new engineer for him to look at. Now I'm at beautiful Ft. Dix defending democracy. I asked Brink (the new engineer) about starting a 3-phase under load and he agreed that was an issue with industrial motors, but ones made for EVs (like mine) have special circuitry to avoid that problem. He's been working on the car for a few days now (since Monday) and hasn't really found anything. He may end up just re-wiring the car, since he doesn't really like the way Joe had set some things up. If the A/C motor is an induction motor, the motor itself should not be "jerky" at all. The gear reduction between the motor and the drive is pretty healthy. All else being setup correctly and tuned right, usually jerky-ness will have to do with the motor speed signal to the controller (especially if it is a bearing encoder). Sometimes the D-gnd signal gets noisy, and can use a supressor, or at a minimum a real good shielding. Since you're starting from scratch, it could be as simple as a poor connection. Hope your new guy finds it and fixes it quickly for you. Safe travels, and hope the training is fun. Find More Posts by Scott H.
Without going into all the details, the car was not wired correctly and this caused several problems -- including the jerkiness issue. Both the controller and DC-DC were damaged as a result of the improper wiring and at some point the BMS got shut off so the system was charging (and discharging) without it. 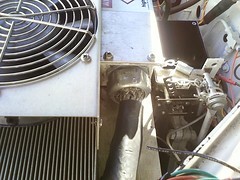 One cell and BMS module were damaged. The improper wiring is also what caused the 12V drain -- there was a draw with the key off (which ruined the deep-cycle battery), and a significant draw with the key on (which is what fried the DC-DC). We've already got the controller back and installed. The car runs great now -- no jerkiness. Brink says it actually runs pretty sweet -- with good acceleration. We're still waiting on the repaired DC-DC. We also still need to replace the damaged cell and BMS module. In the meantime, Brink has re-done all the wiring -- removing a large amount that was redundant -- and putting it all in neat looms. Brink is also fixing some glaring safety issues; installing an inertia switch, an emergency cut-off switch, and removing all HV wiring from inside the cabin (Brink says he's been shocked a few times). He's also relocating (and shielding) some of the HV components under the hood to keep them out of the way. But at least it's getting straightened out now. Keep us updated sounds like when all is said and done you will have an awesome mustang. Here's the motor bay after Brink's cleaned it up a bit. He removed a lot of the wiring -- rerouting some of it and getting rid of some that was redundant. Some of it has been coiled up and set on top of the export brace, to be rerouted later. 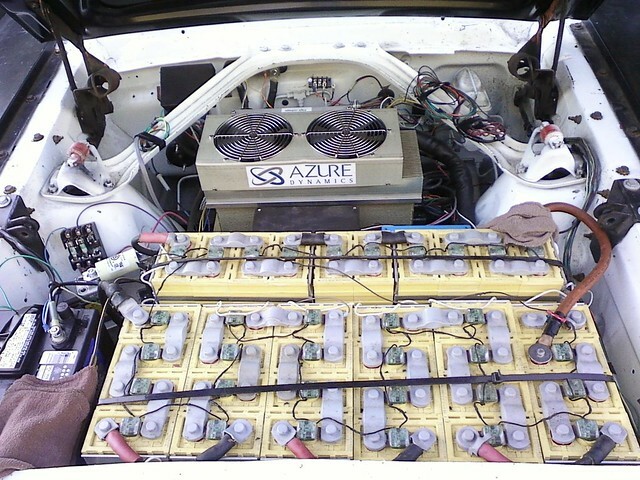 We've replaced the bad battery and Battery Management System (BMS) module. The inertia switch is ordered and on its way -- as is the repaired DC-DC converter. Also, Brink has come up with a new schematic for charging the car. I had to buy new plugs, but now instead of having to go through a series of steps to charge the car (open trunk, turn on breaker, press reset on charger, turn on charger, close trunk), I should be able to just choose my adapter (110 or 220) and plug it in. Nice. Last edited by sailfish11; 09-19-2010 at 01:50 PM. Now it's onto the Restoration..
Are the components able to be removed for the paint job, fairly easily? You going to install a monte carlo bar in those mounts? Maybe you answered this before but how front heavy is that thing compared to a 302 or lets say a 351 even?